Spin Master Zoomer is a new robotic puppy dog for 2013 which is going to be a big year for robot pets. Zoomer is an electronic dalmation puppy who can move around, bark and learn tricks. Zoomer has an iOS and Android app that allows kids to learn how to train their new pet. 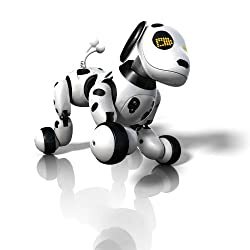 One feature that I think a lot of parents will like is that Zoomer has a rechargeable battery and comes with a USB cable for charging - no batteries to worry about and older kids should be able to manage to recharge their pet themselves. Zoomer moves around, likes to sniff things like a real puppy and can go to sleep. His eyes light up to show expression and his tail wags too. He has sensors to detect touch and for tracking in his environment. He can learn tricks like playing dead and rolling over. He can follow his owner to go for a walk. He has lots of motion and can even balance on three legs (can you imagine what that might be for ...) The range of motion is pretty impressive for a kids toy. Zoomer is recommended for kids from age 5 to 10. He's due for release on September 1st 2013 and is now available to pre-order. I'm not a fan of real pets, but I love the robot kind. There's also a new version of the Tekno / Teksta robot puppy coming out in 2013. And the new Furby Boom is going to be another very popular electronic pet. Whereas Furby will appeal more to girls, Zoomer should appeal to boys and girls who want an electronic pet.